The IMR 18650 3000mah 35A flat top battery is the newest edition to this popular MXJO brand. The MXJO 18650 battery is one of the best for about everything from mechanical mods to starter kits. This 3000mah supercharged power plant of a battery might even change the way you think about vaping batteries all together. If nothing else, switching to one of these high powered MXJO 18650 3000mah batteries will undoubtedly change your vaping experience for the better. Have an MXJO from somewhere else? 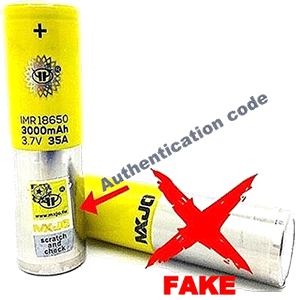 Check authenticity codes for your MXJO at mxjotech.com to verify. These are the only batteries I have owned that the protective coating doesn't start to peel after heavy use. I can't comment on the batteries as I haven't used them yet. I'm saving them for an upcoming trip. i got these after trying 3 other kinds and i am impressed they last hours longer than the other ones i had. normally i put them in at about 6am and the other batteries that i had needed changed when i get home about 330 these ones will last me up till about 7 to 8 that night on a great day and a heavy vape day they are still good till about 6pm when the device tells me to change because of no charge left. Batteries work great and shipped fast also! Nah, not any better than the lower priced , only last me about six hours from full charges.